Looking for a job? 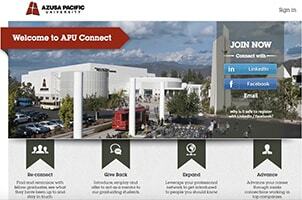 Want to hire an alumnus or student of Azusa Pacific? Handshake is an online job platform for Azusa Pacific students, alumni, and employers. Learn more about posting internship and job opportunities on Handshake. From selecting a major to searching for jobs or internships or applying to graduate school, Azusa Pacific’s Center for Career and Calling offers resources and services to help students and alumni prepare for the next step in their vocational journey. Check out our 2017-18 highlights (PDF), book an appointment with one of our career consultants, view our career guides, or contact us to learn more. Network with more than 3,700 other APU alumni on the Azusa Pacific University Alumni Association LinkedIn Group.